Ginkgo is a technically and scientifically advanced herbal extract. It helps to improve mental sharpness. Clinical studies on Ginkgo biloba extract show that it supports circulation to the brain as well as the extremities. This is achieved by maintaining healthy blood vessel tone and reducing blood viscosity. Additionally, Ginkgo biloba extract is a proven free radical scavenger and antioxidant. This popular herbal medicine is extracted from the fan-shaped leaves of the ancient ginkgo biloba tree, a species that has survived in China for more than 200 million years and now grows throughout the world. Long used in traditional Chinese medicine, it is only in the last few decades that the medicinal uses for the herb have been studied in the West. Recently ginkgo biloba extract has received a great deal of attention for its potential as a memory and mental booster. The herb has been found to help with age-related memory loss. Studies do indicate that the herb can have beneficial effects on the circulatory and central nervous system, it has been shown to act as an antioxidant as well. An extract of ginkgo biloba extract (GBE) is used to make the supplement. It is obtained by drying and milling the leaves and then extracting their active ingredients. When buying look for preparations containing at least 10mg/ginko flavone's & 2.5mg/ginkgolides & bilobalide to be sure you get the greatest benefit. By regulating the tone and elasticity of blood vessels, ginkgo increases blood flow to the brain and extremities, making it particularly useful for circulatory ailments. Research has also shown that ginkgo can enhance the nervous system by promoting the delivery of additional oxygen and blood sugar (glucose) to nerve cells. As an antioxidant, ginkgo mops up the damaging compounds known as free radicals and aids in cell maintenance. Controlled studies have shown that because ginkgo biloba extract aids blood flow to the brain, it can improve memory in people with this memory-robbing condition. Each of these ailments has been linked to reduced blood flow to the brain. In older adults in particular, this problem is often caused by cholesterol buildup in the arteries. By improving blood circulation (including that to the brain), ginkgo biloba extract may be useful for treating these disorders in older people especially. Some studies suggest that ginkgo biloba extract may be of value in treating macular degeneration because it increases blood flow to the nerve-rich fibers of the eyes. The herb's antioxidant capabilities may also help to neutralize the cell-damaging free radicals that are considered a leading cause of this disorder. Ginkgo biloba extracts powerful antioxidant and circulation-promoting properties may also be of help in treating the blurring and dimming of vision caused by cataracts. By reducing the "stickiness" of the blood, as aspirin does, ginkgo biloba extract may lower the risk of blood clots and reduce the risk of heart attacks or stroke. Studies are also evaluating the herb's effectiveness in speeding recovery from stroke. While there are no studies showing that ginkgo biloba extract can prevent memory loss in healthy people, proponents suggest it can help mental decline and optimize brain function. These effects may be due to ginkgo biloba extracts ability to increase blood flow to the brain. Ginkgo should also not be used by people who are taking certain types of antidepressants (monoamine oxidase inhibitors and selective serotonin reuptake inhibitors) or by pregnant women, without first consulting a doctor. Ginkgo side effects and cautions include: possible increased risk of bleeding, gastrointestinal discomfort, nausea, vomiting, diarrhea, headaches, dizziness, heart palpitations, and restlessness. If any side effects are experienced, consumption should be stopped immediately. 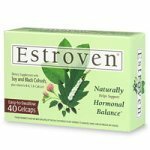 Estroven Gel Caps contains natural ingredients that help reduce night sweats, hot flashes, irritability, anxiety, depression and insomnia associated with menopause.